Set of six enclosed-gear, threaded hex bushing, modern sealed style guitar tuning keys for 6 String Guitars. 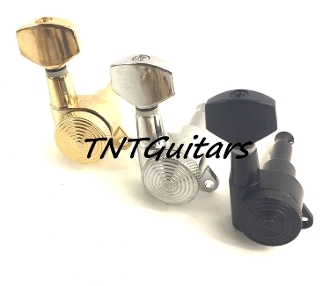 These are locking Sperzel Style guitar tuners. A thumbwheel on the back of the tuner controls the built-in metal locking pin. The pin is a removable part of the key. Simply pull your string through the eyelet, lock the thumbscrew down, and tune to pitch. These tuners use set screws for enhanced stability. Your choice of six right side in line tuners, six left side in line tuners, or 3x3 (3 right + 3 left) set as desired. The 3 x 3 set works for LP style headstocks. The Lefty set works for left-handed guitars and reverse headstocks. If you have a right-handed guitar, select right style in-line tuners. If you have a left-handed guitar or reverse headstock, select left style in-line tuners. If you have a 3x3 set-up, select the 3x3 style. Contact us with any questions prior to purchase. We make it easy to add a single tuner to complete your set if you have a 7 String Guitar. A single add on comes with 1 tuner, 1 bushing, 1 washer, and 1 screw. IMPORTANT PRODUCT NOTE: If you use light-gauge, unwound strings such as 8 or 9, the E & B strings may benefit from a double-loop through the post to create sufficient volume for proper mechanism engagement. This is a purposeful design to allow for heavier gauge use as desired. Do not purchase if you don’t like the idea of double-string engagement for your lighter strings.